8th Street Bridge: Getting To Know YOU! I was unable to participate the last few weekends, so since I have the time I'm jumping in on Keely's blog carnival today. 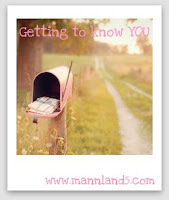 If you want to join in check her out in MannLand! 1. Are you more of a talker or a listener? 2. Bra. Underwire or wireless? These girls need an underwire or else they'd be all over the place! 3. I wish I was...? Hmm... I wish I was able to go on a fantastic beach vacation this summer with Jason and Aidan. Although, we are going home to Ohio for a chunk of time, so I am thankful for that! But man would the beach be great! 4. The Academy Awards are on tonight.. will you watch? Heck yea! Oscars+Alec Baldwin+Kettlecorn= great night for Emily! 5. Do you put deodorant on before or after you get dressed? 6. Would you rather do the dishes or clean the toilets? Definitely the dishes. I would much rather do them than hang out in the bathroom. I hate cleaning the bathroom. 7. How much did you weigh at birth? I was a pretty big baby. Out of the 7 kids in my family I was #2 for weight, weighing in at a chunky 8 lbs 12 oz. My sister Natalie weighed 10 lbs 14 oz. Yikes! My poor Mom! 8. If you could only buy one thing for the Spring/Summer season what would it be? Shoes. I'm on the lookout for some new peep-toe heels. I'm thinking black. I want them. I need them. Let me know if you find anything super cute! Come visit me this summer! We have beaches with big waves (my favorite) to the east and beautiful sand to the west. Aidan is 5 Weeks Old!